Nearly one in three people have had packages stolen from their doorstep, says one survey. So in this gift-giving season it’s a good idea to review ways to make sure you’re not one of them. Pleasant Hill, Calif., resident Erin Miller tracks the packages she orders online, so she was surprised recently when there was no box on her doorstep shortly after she received a notification that it had been delivered. She reviewed the video on her home-surveillance system, and found that while the mail carrier did indeed deliver a package to her porch, a man had approached the door about 10 minutes later and swiped the package. But Miller is certainly not alone. According to a survey by Shorr Packaging Corp., 31 percent of respondents have had a package stolen from their doorstep. Another study by Xfinity Home, Comcast’s home-security service, found that half of Americans knew someone who had a package stolen. Amid the holiday shopping rush, consumers must weigh the convenience of online shopping with the risk of having purchases left on their doorstep in public view, spurring shipping services, retailers and some police departments to find ways to combat package theft. A pair of suspected package thieves were recently arrested in San Jose after being spotted dropping empty Amazon boxes into a Dumpster. The suspects each had a history of property crime and were linked to at least 10 victims. And a scan on neighborhood communications app Nextdoor yielded hundreds of comments from residents in Contra Costa County who had been victims of porch package thievery. Concord police Cpl. Summer Galer said that while it’s hard to track the number of package thefts in the area, because they are categorized with other forms of theft, the department urges people to be especially careful during the holiday season. “(Package thefts are) going to go up during the holidays because people are doing online shopping,” Galer said. More people than ever are shopping online. The U.S. Postal Service said in November that it expected to deliver roughly 850 million packages between Thanksgiving and New Year’s Day and more than 15 billion total pieces of mail this holiday season. UPS said in October it planned to deliver more than 750 million packages globally during the same period — 5 percent more than last year’s peak shipping season volume and a record high. For people like Miller, the Pleasant Hill resident, buying online has become an important convenience. Miller had a baby earlier this year, she said, and finds it difficult to make it to shopping centers with a baby in tow. She loves being able to have items shipped to her, but her experience with package theft has changed the way she goes about it. She is now having her orders shipped to her office to avoid the risk of theft. Recourse for customers who report packages as stolen or undelivered varies among retailers. Many will re-send products without many questions asked, although Miller said the children’s apparel company she had ordered from required her to repurchase her stolen order and work out the refund with her credit-card company. Still, retailers and shipping services have been increasing security measures for package delivery. Amazon offers lockboxes in places like Whole Foods Market stores (the e-commerce giant bought Whole Foods earlier this year) and other grocery and retail locations, where people can go for pickups. UPS and FedEx both have programs allowing customers to reroute packages to secure sites. While a UPS spokesperson insisted that the rate of theft for UPS-delivered packages is low, the company has made efforts to increase security by working with grocery stores, dry cleaners, delis and other spots to provide secure pickup, as well as self-service lockers. FedEx recently expanded a program to offer pickup and drop-off services at 7,500 Walgreens stores across the country. Amazon also recently launched Amazon Key, a program in which Prime customers install an electronic lock at their homes so delivery personnel can open it and drop packages inside, under the watchful eye of a security camera. Walmart is testing a similar service in which delivery people also can load the refrigerator with groceries. 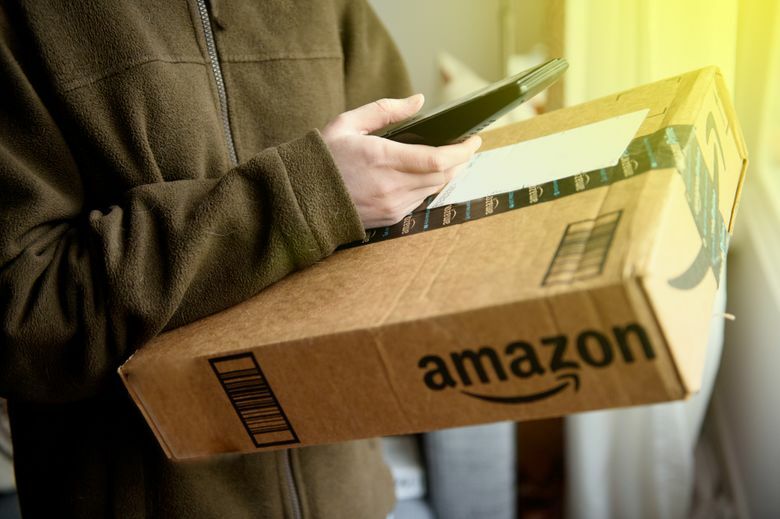 While these programs bring their own set of security concerns, they’re partially aimed at reducing the theft of packages by so-called porch pirates. Police are encouraging consumers to have orders shipped to these secure locations — but some Bay Area police departments are also taking steps to crack down on the problem. The Campbell Police Department last year implemented a “bait” package program in which it works with residents to leave out decoy packages fixed with GPS tracking devices. If thieves steal the package, police are able to track and potentially arrest them. It’s an expansion of a similar program that the department has used for bicycle thefts, said Capt. Gary Berg. Berg said the department has advertised the program in an effort to remind potential thieves that the package they are swiping might actually be a GPS-connected decoy. The Santa Cruz County Sheriff’s Office has implemented a similar decoy package program. Ultimately, though, Berg said the best way to prevent porch package theft is to not have packages left there to steal.